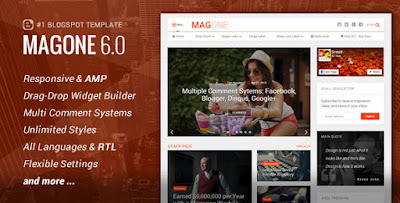 TemplateHack.com - Download MagOne v6.4.3 premium blogger template. Hai guys, today I will share one of best blogger templates look like wordpress, this template name is MagOne. I will share customizable blogger templates MagOne with v6.4.3. this template is SEO Friendly, responsive and can improve your blog visitor instantly. You can use this template for your personal blog, gallery, portal, news, biography, and many more. So lets download it.